December has arrived, and with it all the magic of the season. Christmas is known for been the holiday that brings happiness and joy between families and friends, but what type of happiness are we looking for this time of the year? 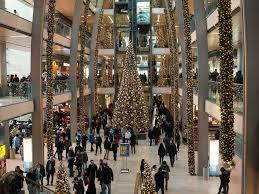 Many people see Christmas as the perfect moment to buy presents and most of all receive them. People also enjoy being surrounded by plenty of food and many of us forget the real meaning of the holiday. It all started decades ago, when the marketing started to play with our heads. Christmas songs, lights, photos with Santa, and of course, presents, are part of the Christmas spirit that make customers spend every year more money. Did you know that in the holidays of 2013, according to “The Center for Retail Research,” the United States retail industry generated around $3 trillion, which was 19.2 percent of the retail industry total sales for the entire year? Plenty of people start their spending in September and other people even earlier. Christmas trees are a major thing that people buy during the holidays. In 2012 there were about 33 million real Christmas trees that were sold and each one costs an average of $35.30. Just imagine how much money is there! People spend on gifts, food, drinks, decorations and Christmas travel. On average, people spend 59.2 percent of their money on gifts, 27.9 percent on food and drinks, 9.9 percent on Christmas travels and 3 percent on decorations. Statista.com published a survey about the estimated Christmas spending of U.S. consumers from 1999 to 2015, and the result for 2015 was an average of $840. This consumerism has change the holiday. Every year there is more spending and the real meaning of Christmas stays in the background. Each person decides how to celebrate the season. Don’t let the marketing make you forget the real meaning of Christmas.